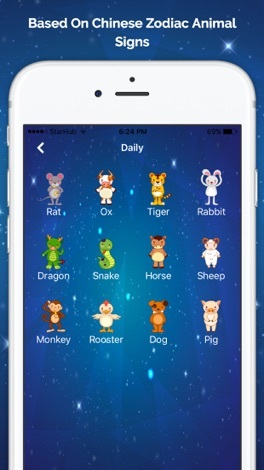 Chinese Daily Horoscope is the Most advanced and best horoscope app for iPhone and iPad. Chinese Daily Horoscopes will give you horoscope of the day for your Chinese zodiac sign based on animal signs used in Chinese Lunar Horoscope. It’s time to check your fortune in the Year of the Rooster 2017. - Share horoscope with anyone via Facebook, Weibo, Twitter, WhatsApp, Snapchat, Instagram, Kik, Wechat, Telegram etc. - You can read Rat Horoscope, Ox Horoscope, Tiger Horoscope, Rabbit Horoscope, Dragon Horoscope, Snake Horoscope, Horse Horoscope, Sheep Horoscope, Monkey Horoscope, Rooster Horoscope, Dog Horoscope and Pig Horoscope. 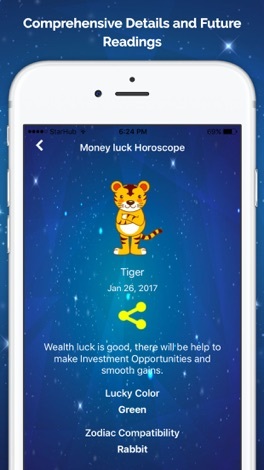 The Chinese Daily Horoscope App offers Daily Horoscope, Love Horoscope, Career Horoscope and Money Horoscope as a Premium Service via Auto-Renewable In-App Purchases. You can subscribe to these horoscope types on 1 month auto-renewable subscriptions. Complete Horoscope is offered as a Free 7 Day Trial. 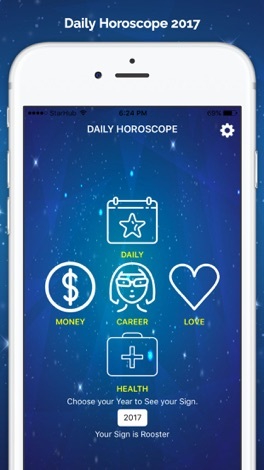 You can access the Complete Horoscope (Love, Money and Career Horoscope) for free upto 7 days from the start of the trial period. 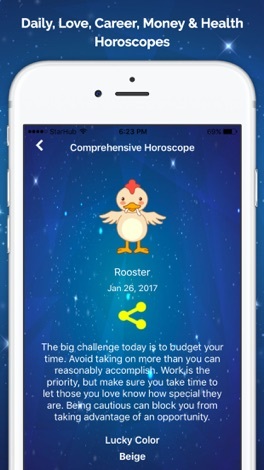 Subscription fee is $2.99/Month for a Complete Horoscope and Once the 7 Day Trial Period Ends, you will be charged $2.99/Month through your iTunes account. Payment will be charged to iTunes Account at confirmation of purchase. The renewal cost will be the same as Subscription Fee. The subscription fee will be charged through your iTunes account as a recurring transaction (auto-renewable subscription), and will automatically renew unless you cancel your account at least 24 hours before the end of the current subscription month. You can manage your subscription, cancel anytime or auto-renewal may be turned off by going to the Your iTunes Account Settings after purchase. Please note, No cancellation of the current subscription is allowed during active subscription period. Please contact interclickmedia@outlook.com, if you are experiencing any issues or bugs. Your daily horoscope is just one tap away ! Silicon Valley School is based on Nirals EduNiv. Please visit http://eduniv.in for complete feature list. This app will be utilized by Water Mold Fire Restoration's field technicians. Our headquarters inputs appointments into our web portal and technicians login to the app to view customers information, create estimates for repairs, and track their payment from us. The awesome MP3 Rhythm Game! Play Rhythm Game with any YouTube Video.